In the fleeting world of computers, “temp“ is a term referring to a folder or subdirectory containing data of only temporary importance. 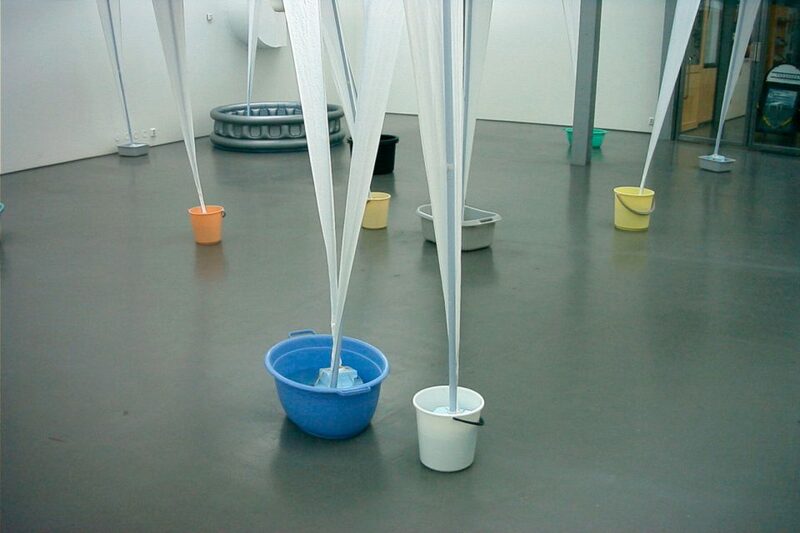 As an exception to inges idee’s usual practice of working out durable and lasting interventions for public space, in this exhibition questions are taken up regarding simple, provisional, and temporary forms of installation. 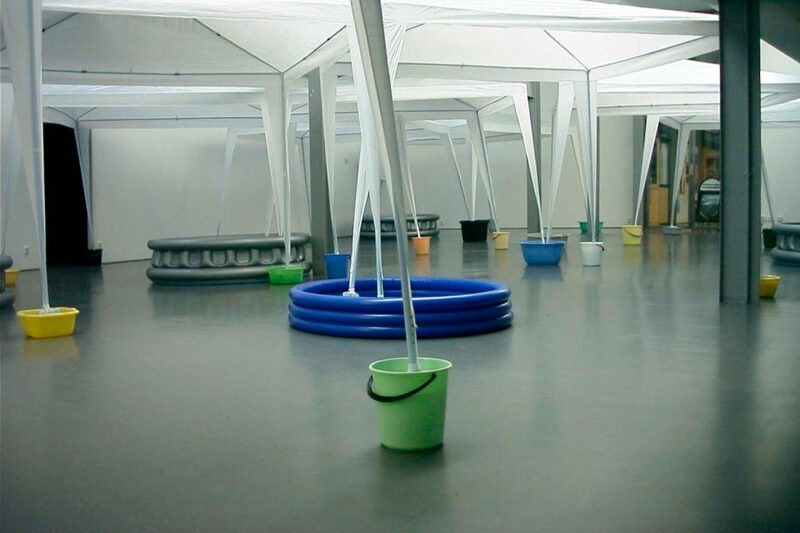 Twenty white party tents float on styrofoam feet in about 60 containers filled with water, thus forming a compact, connected group. 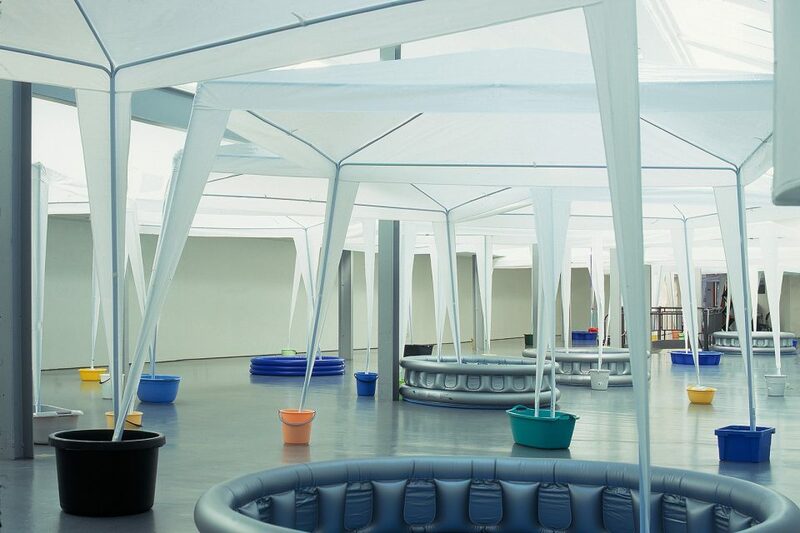 Together with the inflatable swimming pools and laundry hampers, the party tents – internationally standardized mobile leisure architectures – convey an extremely provisional, ephemeral/nomadic impression, which is underscored by the tents’ barely perceptible gliding movement. 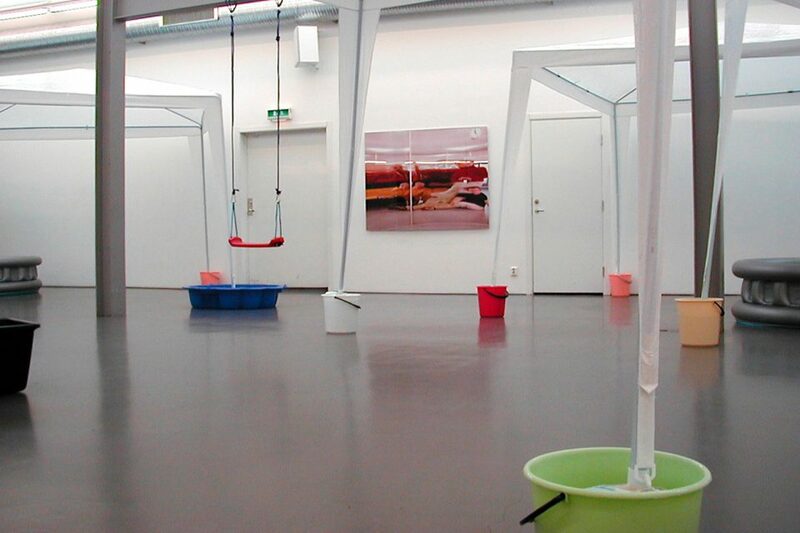 In the front part of the exhibition hall, visitors sitting in a suspended swing can view a large, extremely distorted group photo of the members of inges idee. The photo was taken in the installation Langer Knabe und Spiegelnde Wand, (Tall Boy and Reflecting Wall) at the 27th Primary School in Berlin’s Spandau district in 2000. The exhibition is supplemented by a documentary section presenting the group’s previous projects in the form of a slide show and CD ROM. The theme of movement and the unsettled is also addressed in several earlier projects, including the streetlamp created in 1999 for Linköping’s main train station. The tents allude to the former function of the art hall, which contained the local indoor marketplace before it was remodeled.